THE HIGHEST QUALITY YOU DESERVE: When it comes to products related to your baby, premium quality is a must, don't you agree? That's why our one-of-a-kind miracle silicone dish is constructed by 100% BPA free silicone, which is FDA approved. Forget about risky and chemical ingredients entering your baby's food. Let your toddler enjoy their mealtime while you won't have a single care in this world. PLACE IT ONCE, KEEP IT THERE FOREVER: Thanks to its strong table suction cup, this baby angel feeding bowl will stay on place for entire dinner/lunch time and avoiding mess. Set it on your highchair's tray once, and let it stay there forever. HASSLE-FREE EXPERIENCE: If you're tired from cleaning the floor then this placemat is going to save your peace of mind once and forever and make you both happy. 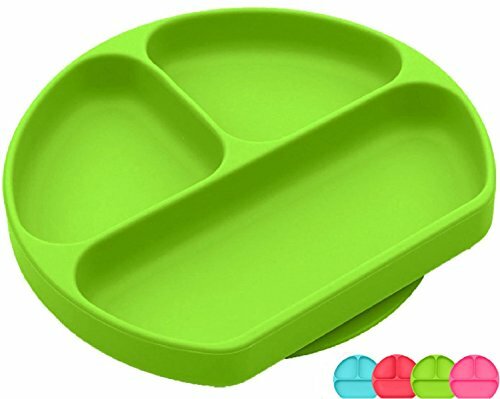 Your kid will use this fantastic tray every time he/she wants to eat without spill food all over the place. Save time and effort just like that! USER-FRIENDLY DESIGN: This cute round rubber mini mat designed to make your lives easier and to fit most high chair trays. Clean it easily and effortlessly, dishwasher safe! Place the bowl on a smooth and flat surface. Make sure the bottom of the plate and the table are clean. Wet the surface for better suction. High Quality Soft Silicone - FDA approved, BPA free, PVC phthalate free 100% food grade material. non toxic, bacteria resistant. Strong Table Suction, Non Slip - SiliKong baby dish will stick to the table during meal time, anti skid, great for toddler self-feed learning / training. Easy To Clean - Dishwasher safe or can be easily washed under soapy warming water. No oil / stain / odor left, waterproof. If you have any questions about this product by SiliKong, contact us by completing and submitting the form below. If you are looking for a specif part number, please include it with your message.